One of the great “politically correct” myths is that people are born equal. A fundamental strength of the human race is that we are all unique individuals and not identical copies rolling off a production line. Our genes fix the envelope of our potential capabilities, and our upbringing determines to what extent we fulfill our potentials. The fundamental fallacy in Marxist theory is in the assumption that a classless society is desirable. In fact it is not even possible. Forcing or coercing unequal people to be “equal” is always unjust. Some have considered class a “necessary evil” and most social theories assume that having classes is, in itself, unfair and a “bad thing”. But there is no example of a successful (sustainable and growing) society which has not had social classes of some kind. Ruling and ruled, rich or poor, aristocracy and peasants, masters and slaves, the political class and the great unwashed, workers and bosses, union members and others, employers and employees, producers and consumers, Brahmins and the Dalits. The Guilds were about capability and competence to begin with but later became contaminated when they became “closed”. Secret societies grew to try and create new classes which cut across other class boundaries. My hypothesis is that in any society, the inherent variations in human capabilities and competences make social classes both inevitable and necessary. Human diversity (genetic and epigenetic) is (I assume) a fundamental component for the success of the human race (again defined as being sustainable and growing). That diversity is what makes people unequal. The inequality is not, in itself, unjust. It just is. We are not clones – thank goodness. Since the French revolution, “egalite” has been made into a fashionable – but false god. A search for “equality” is not just incompatible with, it is also opposed, to a search for justice. It is just for a sick person to receive more care than a healthy person but it is unequal. Affirmative action may be one way of approaching fairness – but it is unequal. The “better man wins” in the Olympics is a celebration of the inherent inequality among humans. If we wanted equality of result, Usain Bolt would have to be handicapped (about 10 m would do). The capitalist goal of “to each as he deserves” and the socialist objective of “to each as he needs” are both expressions which inherently acknowledge the reality of inequality. They both seek their definitions of what is just – not what is equal. The real issue is not, I think, to seek a classless condition which would cause society to break down, but to achieve classes which are not unjust. Classes will appear as a natural consequence of humans being gregarious. The real solution, which may well have to be a dynamic solution to fit the times, is to design the class system to be used, rather than let it appear by default. Most of the perceived injustices of class are connected to either the classes being hereditary or because movement between the classes is forbidden. The Indian caste system is grossly unjust because it is both hereditary and it forbids movement between castes. Having a class system does not necessitate oppression or injustice. At any given time, even the much vaunted “open” Swedish society also has its functioning classes, but to its credit – and even though there is a not an insignificant hereditary component – movement of individuals across class lines is possible, regular and continuous. The real question is what attributes to use in defining classes which help a society to function and which are not unjust. It cannot be along just hereditary lines and it cannot be just based on wealth. However any class system must be able to accommodate the realities of ancestry and wealth. Parents will always seek to give their children an advantage and wealth will always be able to purchase more. Whatever classes we invent must be capable of juxtaposing different levels of wealth within each class and must allow membership from any parentage. It should be possible to move from one class to another. 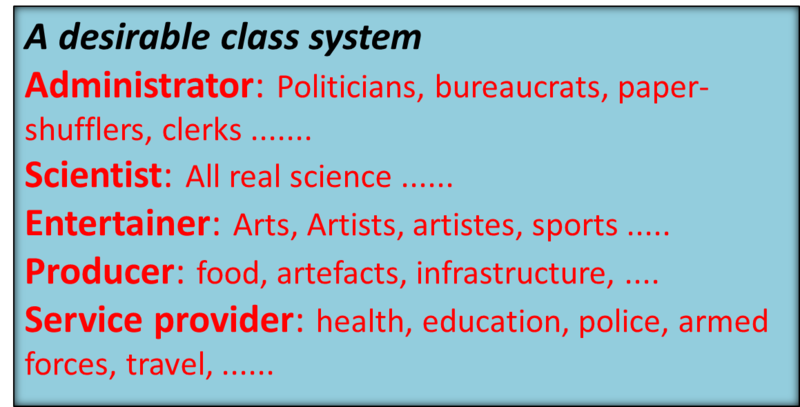 My choice of class system would then be one where the classes themselves did not create a hierarchy and where the main classification criterion would be based on the predominant, gainful occupation of the individual. Each class would have its share of rich and poor, idiots and geniuses, and its share of parasites. Classification would not be until the prefrontal cortex was fully developed (at 25). Everybody under 25 would be a non-adult and classless. Marriage across class lines would be permitted. Voting would then be restricted to adults. I think 5 classes will do. A new research report has been published in Science and only confirms the perception that much of what passes for the science of psychology is still mainly the views and prejudices of the publishing psychologists. Their studies cannot be reproduced in over half of the 100 papers investigated. Even among those found to be reproducible, the significance of the results were exaggerated. ……. he researchers found that some of the attempted replications even produced the opposite effect to the one originally reported. This discipline is surely a valid field of study but is still a long way from being a science. Abstract: Reproducibility is a defining feature of science, but the extent to which it characterizes current research is unknown. We conducted replications of 100 experimental and correlational studies published in three psychology journals using high-powered designs and original materials when available. Replication effects were half the magnitude of original effects, representing a substantial decline. Ninety-seven percent of original studies had statistically significant results. Thirty-six percent of replications had statistically significant results; 47% of original effect sizes were in the 95% confidence interval of the replication effect size; 39% of effects were subjectively rated to have replicated the original result; and if no bias in original results is assumed, combining original and replication results left 68% with statistically significant effects. Correlational tests suggest that replication success was better predicted by the strength of original evidence than by characteristics of the original and replication teams. A study by more than 270 researchers from around the world has found that just 39 per cent of the claims made in psychology papers published in three prominent journals could be reproduced unambiguously – and even then they were found to be less significant statistically than the original findings. ……. ……… Professor Nosek said that there is often a contradiction between the incentives and motives of researchers – whether in psychology or other fields of science – and the need to ensure that their research findings can be reproduced by other scientists. “Scientists aim to contribute reliable knowledge, but also need to produce results that help them keep their job as a researcher. To thrive in science, researchers need to earn publications, and some kind of results are easier to publish than others, particularly ones that are novel and show unexpected or exciting new directions,” he said. However, the researchers found that some of the attempted replications even produced the opposite effect to the one originally reported. Many psychological associations and journals are not trying to improve reproducibility and openness, the researchers said. “This very well done study shows that psychology has nothing to be proud of when it comes to replication,” Charles Gallistel, president of the Association for Psychological Science, told Science. We have professional psychologists who get paid for their theories and we have professional, amateur psychologists (Agony Aunts in the newspapers, TV and Radio psychologists, talk show pundits and the like) who also get paid for providing entertainment. And then we have all the rest of us who each believe we have insights into the human mind and human behaviour, but don’t get paid for it. We haven’t come so far from witch-doctors and Shamans. Retraction Watch has now obtained and translated the report of the investigation by the Dutch National Board for Scientific Integrity (LOWI) into the suspicions about Jens Förster’s research. The conclusions are unavoidable that data manipulation must have taken place and could not have been the result of “sloppy science”. What is particularly intriguing is the method of statistical investigation that was applied. Suspicions were not only because the data showed a remarkable linearity but that sub-sets of the data did not. The first suggests confirmation bias (cherry picking) but the second brings data manipulation into play. Non-linearity in sub-sets of data cannot just neatly cancel themselves out giving – fortuitously for the hypothesis – a linearity in the complete data set. The investigation methods are of more value than the Förster paper to be retracted. I have an aversion to “science” based on questionnaires and “primed” subjects. They are almost as bad as the social psychology studies carried out based on Facebook or Twitter responses. They give results which can rarely be replicated. (I have an inherent suspicion of questionnaires due to my own “nasty” habit of “messing around” with my responses to questionnaires – especially when I am bored or if the questionnaire is a marketing or a political study). Of course priming works— it couldn’t not work. But the lack of control over the information contained in social priming experiments guarantees unreliable outcomes for specific examples. .. This gets worse because social priming studies are typically between-subject designs, and (shock!) different people are even more different from each other than the same people at different times! Then there’s also the issue of whether the social primes used across replications are, in fact, the same. It is currently impossible to be sure, because there is no strong theory of what the information is for these primes. In more straight forward perceptual priming (see below) if I present the same stimulus twice I know I’ve presented the same stimulus twice. But the meaning of social information depends not only on what the stimulus is but also who’s giving it and their relationship to the person receiving it, not to mention the state that person is in. And results from such studies, if they cannot be replicated, and even if they are the honest results of the study, have no applicability to anything wider than that study. Here we analyze results from three recent papers (2009, 2011, 2012) by Dr. Jens Förster from the Psychology Department of the University of Amsterdam. These papers report 40 experiments involving a total of 2284 participants (2242 of which were undergraduates). We apply an F test based on descriptive statistics to test for linearity of means across three levels of the experimental design. Results show that in the vast majority of the 42 independent samples so analyzed, means are unusually close to a linear trend. Combined left-tailed probabilities are 0.000000008, 0.0000004, and 0.000000006, for the three papers, respectively. The combined left-tailed p-value of the entire set is p= 1.96 * 10-21, which corresponds to finding such consistent results (or more consistent results) in one out of 508 trillion (508,000,000,000,000,000,000). Such a level of linearity is extremely unlikely to have arisen from standard sampling. We also found overly consistent results across independent replications in two of the papers. As a control group, we analyze the linearity of results in 10 papers by other authors in the same area. These papers differ strongly from those by Dr. Förster in terms of linearity of effects and the effect sizes. We also note that none of the 2284 participants showed any missing data, dropped out during data collection, or expressed awareness of the deceit used in the experiment, which is atypical for psychological experiments. Combined these results cast serious doubt on the nature of the results reported by Dr. Förster and warrant an investigation of the source and nature of the data he presented in these and other papers. Förster’s primary thesis in the 3 papers under suspicion is that the global versus local models for perception and processing of data which have been studied and applied for vision are also also valid and apply to the other senses. 1. Förster, J. (2009). Relations Between Perceptual and Conceptual Scope: How Global Versus Local Processing Fits a Focus on Similarity Versus Dissimilarity. Journal of Experimental Psychology: General, 138, 88-111. 2. Förster, J. (2011). Local and Global Cross-Modal Influences Between Vision and Hearing, Tasting, Smelling, or Touching. Journal of Experimental Psychology: General, 140, 364-389. Abstract: Holistic (global) versus elemental (local) perception reflects a prominent distinction in psychology; however, so far it has almost entirely been examined in the domain of vision. Current work suggests that global/local processing styles operate across sensory modalities. .As for vision, it is assumed that global processing broadens mental categories in memory, enhancing creativity. Furthermore, local processing should support performance in analytic tasks. Throughout separate 12 studies, participants were asked to look at, listen to, touch, taste or smell details of objects, or to perceive them as wholes. Global processing increased category breadth and creative relative to analytic performance, whereas for local processing the opposite was true. Results suggest that the way we taste, smell, touch, listen to, or look at events affects complex cognition, reflecting procedural embodiment effects. My assumption is that if the data have been manipulated it is probably a case of “confirmation bias”. Global versus local perception is not that easy to define or study for the senses other than vision – which is probably why they have not been studied. Therefore the data may have been “manufactured” to conform with the hypothesis that “the way we taste, smell, touch, listen to, or look at events does affect complex cognition and global processing increases category breadth and creativity relative to analytic performance, whereas local processing decreases them”. The hypothesis becomes the result. Distinctions between global and local perceptions of hearing are not improbable. But for taste? and smell and touch?? My perception of the field of social psychology (which is still a long way from being a science) is that far too often improbable hypotheses are dreamed up for the effect they have (not least in the media). Data – nearly always by sampling groups of individuals – are then found/manipulated/created to “prove” the hypotheses rather than to disprove them. Our findings may have implications for our daily behaviors. Some objects or people in the real world may unconsciously affect our cognition by triggering global or local processing styles; while some may naturally guide our attention to salient details (e.g., a spot on a jacket, a strong scent of coriander in a soup), others may motivate us to focus on the gestalt (e.g., because they are balanced and no special features stand out). It might be the case then that differences in the composition of dishes, aromas, and other mundane events influence our behavior.We might for example attend more to the local details of the answers by an interview candidate if he wears a bright pink tie, or we may start to become more creative upon tasting a balanced wine. This is because our attention to details versus gestalts triggers different systems that process information in different ways. The description of the methods used in the paper give me no sense of any scientific rigour – especially those regarding smell – and I find the entire “experimental method” quite unconvincing. Participants were seated in individual booths and were instructed to recognize materials by smelling them. A pretest reported in Förster (2011) led to the choice (of) tangerines, fresh soil, and chocolate, which were rated as easily recognizable and neutral to positive in valence (both when given as a mixture but also when given alone). After each trial, participants were asked to wait 1 minute before smelling the next sample. In Study 10a, in the global condition, participants were presented with three small bowls containing a mixture of all three components; whereas in the local condition, the participants were presented with three small bowls, each containing one of the three different ingredients. In the control condition, they had to smell two bowls of mixes and two bowls with pure ingredients (tangerines and soil) in random order. A science it is certainly not. Jens Förster denies the claims of misconduct and has sent an email defending himself to Retraction Watch. One would have thought the credentials of social psychology as a science – after Diedrik Staple, Dirk Smeesters and Mark Hauser – could not fall much lower. But data manipulation in social psychology would seem to be a bottomless pit. Another case of data manipulation by social psychologists has erupted at the University of Amsterdam. This time by Jens Förster professor of social psychology at the University of Amsterdam and his colleague Markus Denzler. The University of Amsterdam has called for the retraction of a 2011 paper by two psychology researchers after a school investigation concluded that the article contained bogus data, the Dutch press are reporting. The paper, “Sense Creative! The Impact of Global and Local Vision, Hearing, Touching, Tasting and Smelling on Creative and Analytic Thought,” was written by Jens Förster and Markus Denzler and published in Social Psychological & Personality Science. …. Jens Förster is no lightweight apparently. He is supposed to have research interests in the principles of motivation. Throughout my own career the practice of motivation in the workplace has been a special interest and I have read some of his papers. Now I feel let down. I have a theory that one of the primary motivators of social psychologists in academia is a narcissistic urge for media attention. No shortage of ego. And I note that as part of his webpage detailing his academic accomplishments he also feels it necessary to highlight his TV appearances!!!! They love being Darlings of the media and the media oblige! As a commenter on Retraction Watch points out, Förster also doubles as a cabaret artist! Perhaps he sees his academic endeavours also as a form of entertaining the public. This revelation occurs at a bad time for Förster, write the Dutch media. He is supposed to work as “Humboldt professor starting from June 1, and he was awarded five million Euros to do research at a German university the next five years. He is also supposed to cooperate with Jürgen Margraf – who is the President of the “German Society for Psychology” and as such the highest ranking German psychologist. Roxanne L. Parrott is the Distinguished Professor of Communication Arts and Sciences at Penn State. Reading about this paper is not going to get me to read the whole paper anytime soon. The study the paper is based on – to my mind – is to the discredit of both PennState and the state of being “Distinguished”. I am not sure what it is but it is not Science. The researchers, who reported their findings in the online issue of the Journal of Health Communication, recruited 323 university students for the study. The participants were randomly assigned a message that was altered to contain one of three different ways of presenting the statistics: a text with percentages, bar graph and both text and graphs. The statistics were related to three different messages on genetically modified foods, including the results of an animal study, a Brazil nut study and a food recall announcement. Wow! The effort involved in getting all of 323 students to participate boggles. And taking Math Anxiety as a critical behavioural factor stretches the bounds of rational thought. Could they find nothing better to do? This study is at the edges of academic misconduct. “This is the first study that we know of to take math anxiety to a health and risk setting,” said Parrott. It ought also to be the last such idiot study – but I have no great hopes. Made-up science: “Liking” or “disliking” in general is a personality trait! This comes into the category – not of bad science – but what I would call “made-up science” where something fairly trivial and obvious is made sufficiently complicated to be addressed by “scientific method”. It is apparently called “dispositional attitude” and it has a 16-item scale to measure an individual’s propensity to generally like or dislike any stimulii! “This surprising and novel discovery expands attitude theory by demonstrating that an attitude is not simply a function of an object’s properties, but it is also a function of the properties of the individual who evaluates the object,” So a “liker” likes everything and a “hater” hates everything! “Dispositional Attitude” seems neither surprising nor so very novel. Not so very different from what has been called the “Observer Effect” in physics or the “actor-observer assymetry” in attribution theory. It is unnecessarily trying to complicate what is little more than a cliche. Beauty – or liking or hating – lies in the eye of the beholder and if your personality wears rose-coloured glasses – surprise, surprise – everything appears red. Justin Hepler & Dolores Albarracin, “Attitudes without objects: Evidence for a dispositional attitude, its measurement, and its consequences,”, J Pers Soc Psychol. 2013 Jun;104(6):1060-76. doi: 10.1037/a0032282. Epub 2013 Apr 15. People with a positive dispositional attitude have a strong tendency to like things, whereas people with a negative dispositional attitude have a strong tendency to dislike things, according to research published in the Journal of Personality and Social Psychology. The journal article, “Attitudes without objects: Evidence for a dispositional attitude, its measurement, and its consequences,” was written by Justin Hepler, University of Illinois at Urbana-Champaign, and Dolores Albarracín, Ph.D., the Martin Fishbein Chair of Communication and Professor of Psychology at Penn. However, they note, there is still one critical factor that an individual’s attitudes will have in common: the individual who formed the attitudes. “Some people may simply be more prone to focusing on positive features and others on negative features,” Hepler said. …..
the big-five and optimism). The dispositional attitude construct represents a new perspective in which attitudes are not simply a function of the properties of the stimuli under consideration, but are also a function of the properties of the evaluator. We discuss the intriguing implications of dispositional attitudes for many areas of research, including attitude formation, persuasion, and behavior prediction.